To stall bankruptcy, desperate debtors often borrow from their 401(k) retirement plans to get immediate cash flow. But what happens when debtors are ultimately forced to file bankruptcy and can’t repay the loan? What if a debtor files bankruptcy, but can repay? 401(k) loans present a conundrum because they are not viewed as true loans; therefore, cannot be forgiven in bankruptcy. A 401(k) is an employer-sponsored retirement plan with favorable tax benefits. Workers invest a percentage of each paycheck into stocks, bonds and money market funds. The employee decides how the money is invested, thereby controlling risk. Complex tax rules determine when a participant can withdraw money from the 401(k) account before retirement age. A 401(k) loan differs from a withdrawal because the loan is paid back to the account. When an employee borrows from a 401(k), the worker is borrowing his own money. In Chapter 7 bankruptcy, most debts simply vanish. The bankruptcy court wipes the slate clean, but the debtor must give up any property that is not protected by law to satisfy creditors. On the other hand, Chapter 13 bankruptcy protects your assets by setting up a long-term repayment plan. Another difference between the chapters is timing. 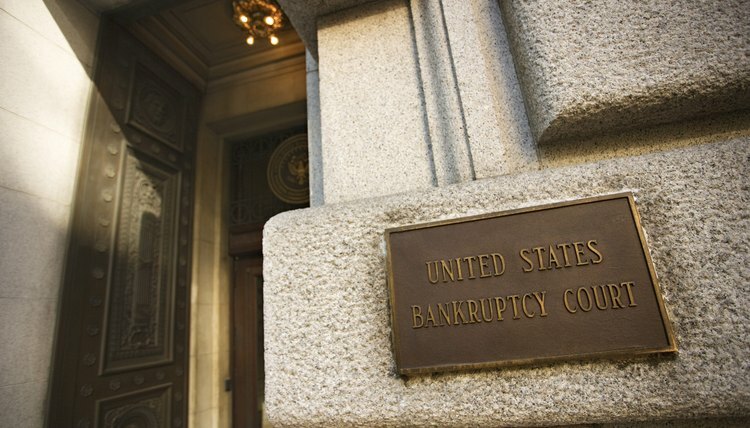 Chapter 7 bankruptcy can take as little as a few months while a Chapter 13 bankruptcy can last up to five years. To qualify for Chapter 7 bankruptcy, a debtor must pass a means test. Generally, a debtor's pay cannot exceed the median income for a household of similar size in his state of residence. In Chapter 13, a means test is only used to determine a debtor's disposable monthly income. This lets the court know how much a debtor is able to repay creditors on a monthly basis. Loan payments to a retirement plan are exempt from the Chapter 13 means test. Bankruptcy law borrows the Internal Revenue Service's necessary expenses test. The IRS categories are food, housekeeping supplies, apparel and services, personal care products and services, and miscellaneous. Because participation in a retirement fund is voluntary, federal bankruptcy law does not view contributions as a necessary expense. Likewise, courts see 401(k) loan payments in the same light as voluntary contributions; therefore, not as a necessary expense. In a Chapter 7 bankruptcy, 401(k) loans are not counted as secured debt, either. Deducting a 401(k) loan in Chapter 7 to increase a debtor’s monthly expenses could lead to dismissal of the bankruptcy or force the debtor into Chapter 13. If feasible, a debtor can continue to repay a 401(k) loan in a Chapter 13 bankruptcy to avoid default. When a 401(k) loan is not repaid, tax laws deem the balance a withdrawal from the retirement account. The result has significant consequences. Typically, more than 40 percent of the default loan balance will go to satisfy federal and state taxes and penalties. The Bricks Law Group: How Much Do You Have to Pay Your Unsecured Creditors in Chapter 13 Bankruptcy? Kiplinger: Will a 401(k) Loan Default Hurt My Credit?